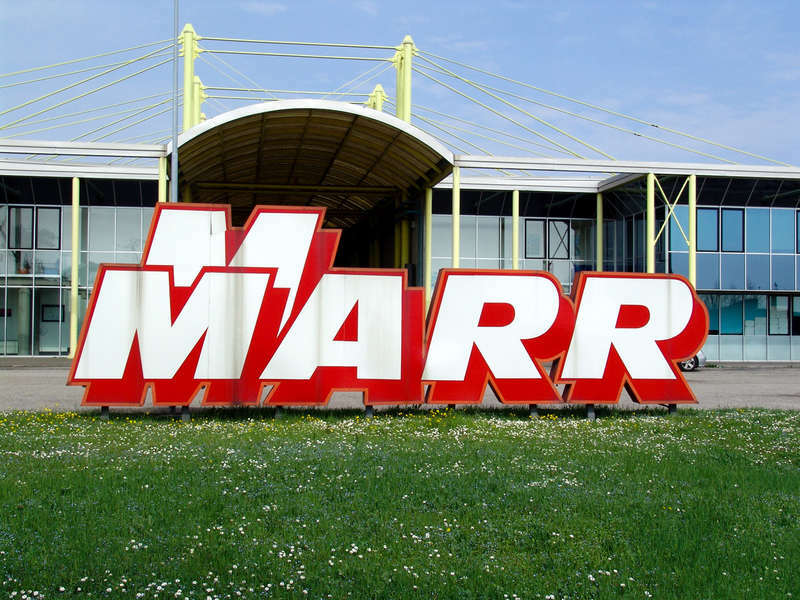 The Board of Directors of MARR S.p.A. (Milan: MARR.MI), the Cremonini Group leading company in Italy in the sale and distribution of food products to the foodservice sector, today approved the consolidated financial statements and the draft of the MARR S.p.A. financial statements for the 2017 business year, that will be submitted to the Shareholders’ Meeting on 28 April. The 2017 business year closed with total consolidated revenues amounting to 1,624.6 million Euros, compared to 1,544.4 million in 2016. The operating profits also increased, with EBITDA of 116.0 million Euros (111.0 in 2016) and EBIT of 97.0 million (92.7 in 2016). The net consolidated profits amounted to 65.5 million Euros, an increase compared to 58.5 million in 2016, also thanks to a reduction in the taxation charges due to the reduction in the IRES rate. As at 31 December 2017, the net trade working capital amounted to 195.4 million Euros, a reduction compared to 205.9 million Euros at the end of the 2016 business year. The net financial position as at 31 December 2017 amounted to 157.6 million Euros (177.5 million at the end of 2016) with a Net Debt / EBITDA ratio of 1.4x, an improvement compared to 1.6x in 2016. The net consolidated equity as at 31 December 2017 amounted to 304.7 million Euros (285.6 million Euros in 2016). The Board of Directors has proposed to the Shareholders’ Meeting to be held on 28 April the distribution of a gross dividend of 0.74 Euros (0.70 Euros the previous year) with “ex-coupon” (no. 14) on 28 May, record date on 29 May and payment on 30 May. The profits not distributed will be allocated to the Reserves. Sales of the MARR Group in 2017 amounted to 1,599.5 million Euros, compared to 1,516.2 million in 2016. In particular, the sales to customers in the Street Market and National Account categories reached 1,335.5 million Euros (1,263.7 million in 2016). Sales in the main Street Market category (restaurants and hotels not belonging to Groups or Chains) reached 1,048.7 million Euros (983.9 million in 2016), with a contribution of 18.3 million Euros from the acquisitions of DE.AL. (4 April 2016) and Speca (effective from 1 January 2017). Sales to clients in the National Account category (operators of Chains and Groups and Canteens) amounted to 286.8 million Euros (279.8 in 2016). Sales to customers in the Wholesale category reached 264.0 million Euros, compared to 252.5 million in 2016. The outlook for the reference market of out-of-home food consumption in Italy (“foodservice”) is that it may show growth trends also in 2018. In order to take advantage of most of the market opportunities and strengthen its leadership, the MARR Group has confirmed its focus on process and product innovation as a means of enhancing the specialisation of its commercial offer and thus fostering client loyalty. This market approach is pursued together with the objective of maintaining the levels of profitability achieved and keeping the absorption of the working capital under control.